This was the first match in a four-man mini tournament to decide the new number one contender to the TV title. Facade used some flashy moves to evade Isom early, then connected with a leg lariat. He used a nice arm-trap submission into a pinning combination. Isom fired back with kicks and punches and a launching Northern Lights suplex to send Facade to the floor. Isom connected with a head-first dive to the outside. Isom went for a pin out of a belly-to-back suplex. Facade fought back and used some kicks to send Isom to the outside. He then landed a step-up springboard 450 clothesline on Isom. Back in the ring, Facade used a Burning Hammer, which he calls the Neon Ember. He nailed the Neon Terminator, which is a huge springboard kick across the ring, and went for the pin, but Isom kicked out at two. Facade was frustrated, and that led to his demise as Isom was able to regain his composure and land a brainbuster suplex for the win. Jay Lethal cut a promo on Matt Taven and said that Taven was a pretender, and that eventually their paths would cross. 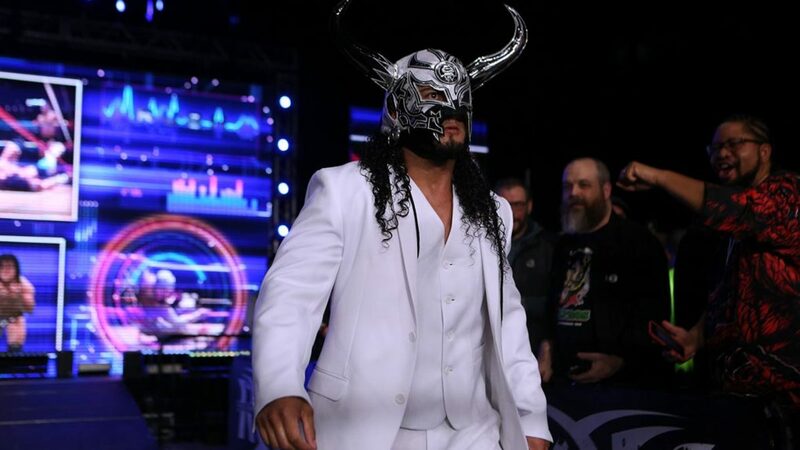 The announcers recapped the debut of PCO and Brody King, who aligned with Marty Scurll to form Villain Enterprises. This was the debut of the newly-signed Rush. A sequence of amateur wrestling started the match, followed by a move-for-move back-and-forth that ended in a missed dropkick by both. This led to a violent striking exchange. O’Ryan cut him off and the fight spilled outside. Back in the ring, O’Ryan went to work on the CMLL star. O’Ryan chopped him furiously, but Rush used a superkick to get the momentum. After the break, another vicious chop exchange was taking place. Rush ran at him in the corner but instead used a fake-out and a stomp to blast O’Ryan. Rush used an overhead suplex and threw O’Ryan into the corner. O’Ryan caught Rush while running with a beautifully-timed spinebuster. He went for a tornado DDT, but Rush instead used a headbutt to lift up O’Ryan for a huge superplex. Rush turned it on and smashed O’Ryan with a running dropkick in the corner, which was enough to get Rush the pin. After the match, Vinny Marseglia appeared from under the ring with Taven and they used a three-man conchairto to the head of Rush. Rhett Titus joined Ian Riccaboni, Colt Cabana, and Caprice Coleman on commentary. He said he was appalled by Bruiser’s body. This was the second match in the mini-tournament. Before the match, Bruiser said he was sick of Young insulting him and wanted to make it a no DQ match. Young accepted. It was a game of cat-and-mouse with Young chasing Bruiser around early. They made their way to the outside and Bruiser positioned Young seated in a chair. He then went to the apron and performed a running flip dive off the apron onto Young. After the break, Young was attacking the legs of Bruiser. He connected with an Anarchist suplex on the big man, and then went to retrieve a table. He set up the table in the corner, which backfired as Bruiser managed to land another running flip attack, driving Young through the table. Young managed to kick out at 2.5. The fight continued out on the floor, where Bruiser again placed Young across two chairs and went up to the top turnbuckle. Young revived himself and cut off Bruiser. A battle on the top rope ended with Bruiser hip tossing Young off the top turnbuckle into the ring. For a third time, Bruiser laid Young across some chairs and went up top. This time, Young scurried up to his feet and slammed Bruiser off the turnbuckle through the chairs. That only earned Young a two count, so out of frustration he went under the ring to get zip-ties. Young zip-tied the big man to the top rope and began waffling him with chair shots until Brian Milonas ran out for the save. Milonas laid out Young and cut Bruiser loose. Milonas was attempting a seated splash when Young popped up and shoved him over the top rope and through the second table that had been set up earlier on the floor. Bruiser laid a chair across the chest of Young and dropped a big elbow onto him. Bruiser set up a third table and laid out Young on it and again went up top. Bruiser went for a splash, but Young moved and Bruiser crashed through the table. Young followed that up with his finisher, Misery, which was finally enough to keep Bruiser down for the three count. Young will be facing Eli Isom in two weeks in the tournament finals to determine a number one contender for Jeff Cobb's TV title.